KU-55933 (ATM Kinase Inhibitor) is a potent and specific ATM inhibitor with IC50/Ki of 12.9 nM/2.2 nM in cell-free assays, and is highly selective for ATM as compared to DNA-PK, PI3K/PI4K, ATR and mTOR. Effects of NVP-BKM120 and KU-55933 and their combination on the DNA damage response. A, HCC1937 cells were treated for 18 hours with NVP-BKM120 at 2.5 μmol/L, KU-55933 at 10 μmol/L, or their combination, subjected to ionizing radiation(IR) with 10 Gy or mock, lysed 6 hours later, and subjected to immunoblotting with antibodies as indicated. KU-60019 is an improved analogue of KU-55933, with IC50 of 6.3 nM for ATM in cell-free assays, 270- and 1600-fold more selective for ATM than DNA-PK and ATR,and is a highly effective radiosensitizer. The ATM-dependent Ser15-p53 phosphorylation was monitored by Western blotting. Protein loading levels were monitored by probing for actin. VE-821 is a potent and selective ATP competitive inhibitor of ATR with Ki/IC50 of 13 nM/26 nM in cell-free assays, shows inhibition of H2AX phosphorylation, minimal activity against PIKKs ATM, DNA-PK, mTOR and PI3Kγ. 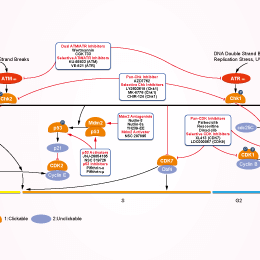 Cell viability response to ATR inhibitor. AZ31 is a selective and novel ATM inhibitor with an IC50 of <0.0012 μM. It shows excellent selectivity over closely related enzymes (>500 fold selective over DNA-PK and PI3Kα and >1000 fold selective over mTOR, PI3Kβ and PI3Kγ). AZ32 is a specific inhibitor of the ATM kinase that possesses good BBB penetration in mouse with an IC50 value of <0.0062 μM for ATM enzyme. It shows adequate selectivity over ATR and also has high cell permeability. AZD1390 is a first-in-class orally available and CNS penetrant ATM inhibitor with an IC50 of 0.78 nM in cells and >10,000-fold selectivity over closely related members of the PIKK family of enzymes and excellent selectivity across a broad panel of kinases. CP-466722 is a potent and reversible ATM inhibitor, does not affect ATR and inhibits PI3K or PIKK family members in cells. HCT116 cells expressing the DDR-Act reporter were treated with Etoposide 20 μM (E20) for 24 hours, in the absence or in the presence of KU-55933 or CP-466722 at the indicated concentration. (A) Western blot analysis of p53 and actin as control. VE-822 is an ATR inhibitor with IC50 of 19 nM in HT29 cells. Flow cytometry analysis of E14.5 FL lineage negative cells from indicated genotypes treated with ATMi (KU-55933; 1nM), ATRi (VE-822; 1nM) or both inhibitors or DMSO as a negative control for 24 hours in culture before AnnexinV and PI levels were measured. CGK 733 is a potent and selective inhibitor of ATM/ATR with IC50 of ~200 nM. K562 and K562R cells were pre-treated for 1 h with CGK733 (5 μM), then treated with CTD (10 μM) for 24 h, and protein levels of cleaved PARP, Mcl-1, and phosphorylated H3 were determined by Western blotting. GAPDH served as a normal control. AZ20 is a novel potent and selective inhibitor of ATR kinase with IC50 of 5 nM in a cell-free assay, 8-fold selectivity over mTOR. (B) SAHA treatment impairs the HR capacity of GBM03 cells. AZ20(ATRi) as a positive control. AZD6738 is an orally active, and selective ATR kinase inhibitor with IC50 of 1 nM. Phase 1/2. Number of γH2AX foci per cell of irradiated (2 Gy) SAS cells treated with inhibitors against ATM (ATMi, KU55933), DNA-PK (DNA-PKi, KU57788), or ATR (ATRi, AZD6738) with or without LY364947. Wildtype bone marrow-derived macrophages (BMDMs) were incubated with and without the MRN complex inhibitor mirin (administered dose of 100 μM) for 2 hours, then were treated with PM (100 μg/mL) for an additional 24 hours. (A) The relative levels of Cxcl1, Cxcl2 and Ifn-γ mRNA transcripts were determined using quantitative PCR. (B) The protein levels of Cxcl1, Cxcl2 and Ifn-γ in the culture supernatants were measured using ELISA. Data are presented as means ± SEMs across at least 3 independent experiments. *p < 0.05; **p < 0.01. BAY 1895344 is a potent, highly selective and orally available ATR inhibitor with an IC50 of 7 nM.